Sheraton Grand Sydney Hyde Park is centrally located in Sydney, a 3-minute walk from Sydney Tower and 13 minutes by foot from Royal Botanic Gardens. This 5-star hotel is 0.9 mi (1.5 km) from SEA LIFE Sydney Aquarium and 1.2 mi (2 km) from The Rocks Markets. Make yourself at home in one of the 558 air-conditioned rooms featuring iPod docking stations and LCD televisions. Complimentary wired and wireless Internet access keeps you connected, and cable programming provides entertainment. Private bathrooms with separate bathtubs and showers feature complimentary toiletries and hair dryers. Conveniences include phones, as well as laptop-compatible safes and desks. 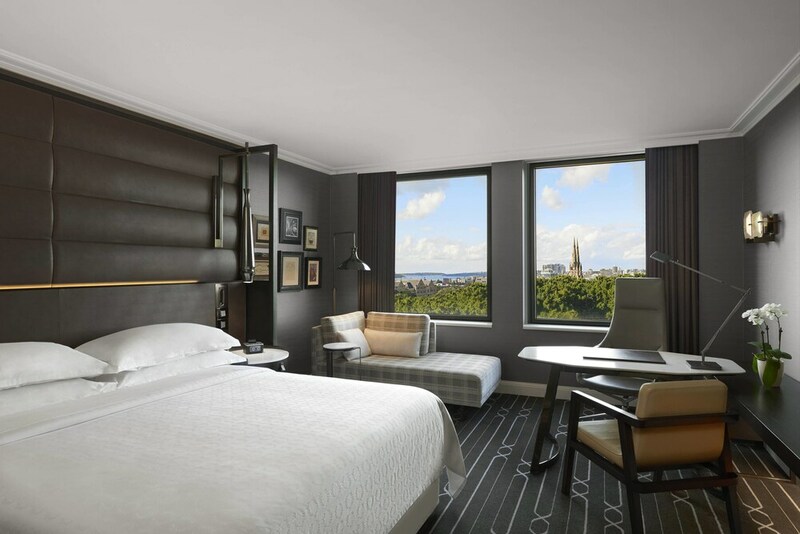 Featuring 558 luxury guestrooms and suites, Sheraton Grand Sydney Hyde Park is the only five star hotel on Hyde Park and is renowned for being the benchmark of classic hotels in Sydney. The property features the newly renovated Sheraton Club on level 21, a Health Club with a stunning 13 meter (43 feet) indoor rooftop pool and state of the art 24 hour fitness facility, as well as a variety of food and beverage venues offering guests extensive dining options. The Sheraton Club provides Sydney’s premier hotel club lounge experience with a suite of tailored offerings designed to make a guest’s stay effortless. All Sheraton Grand Sydney Hyde Park guests staying in a Grand Executive guestroom or above are welcomed to the Club Lounge. Services include separate check-in and check-out within the lounge, 1 hour Private Executive Boardroom use during stay, complimentary light continental plus breakfast and evening drinks and canapés served daily, complimentary pressing of 2 garments per day and more. Additional services that ensure an unforgettable includes complimentary WiFi across all guestrooms and public areas, an experienced multilingual team offering 24 hour assistance, on-site valet and self-parking services. Sheraton Grand Sydney Hyde Park is a smoke-free property. Feast - Located on level one. Open for breakfast, lunch, and dinner seven days weekly. Features contemporary à la carte and buffet-style dining in a relaxed yet stylish area with views over Hyde Park. Specialities include a seasonal seafood buffet. Brunch is offered every Sunday. The Gallery - Indulge in the enduring tradition of high tea at The Gallery. Showcasing a striking design and drawing inspiration from the iconic Hyde Park, the luxurious design and modernist approach has resulted in an elegant all-day venue that is enticing and refined. Enjoy an array of sweet and savory treats accompanied by a choice of Vittoria espresso coffees, fragrant Dilmah teas, or sip on a glass of Champagne to add sparkle to the occasion. On the weekend The Gallery transforms, offering an exquisitely presented Afternoon Tea Buffet. The Conservatory Bar & Terrace - Located on level one. Subtle frosted tones and 2-storey-high windows create a striking atmosphere. Offers a large selection of beers and wines from around the globe in addition to classic and innovative cocktails. Light snacks include olives and bruschetta, rock oysters, and king prawns. Popular for post-work drinks, pre-dinner aperitifs, and nightcaps. Smoking permitted on outdoor terrace. Live piano entertainment on Friday and Saturday nights. Open daily. Sheraton Club -The dress code during our evening drinks and canapés service is smart casual with appropriate footwear. Thongs/flip-flops and hotel slippers are not permitted. The Sheraton Grand Sydney Hyde Park health club is located on level 22, the hotel's top floor, and is open seven days weekly. The indoor heated 13-metre pool with city-view terrace, male and female sauna rooms, locker rooms, and spa are open for complimentary use. Casual entry surcharge applies to fitness centre where guests can use treadmills, bikes, rowing machines, step machines, and both free and pinned weights. Personal trainers, massages, and beauty treatments by On the Park Rejuvenation in dedicated treatment rooms are available for additional surcharges. Nearby recreational choices include the scenic foreshore walking/jogging track in the Royal Botanic Gardens (1.5 km away), which runs all the way from Mrs.
Macquarie's Chair to the Sydney Opera House. Hyde Park is just across the street. The recreational activities listed below are available nearby; fees may apply. See the front desk for more information. Rollaway/extra beds are available for AUD 110 per night. The property has connecting/adjoining rooms, which are subject to availability and can be requested by contacting the property using the number on the booking confirmation. Free in-room WiFi has a 3-device limit. Book a stay in an Executive Level room category and receive pre-dinner drinks and canapes, complimentary pressing of 2 clothing items, and a free shoeshine on day of arrival. Must book a qualifying room to receive benefits. Full details at check-in. Offer subject to availability. Rooms include significant additional features and benefits not listed above. Taxes and gratuity may not be included. No refunds for any unused portion of offer. Offer is not valid with groups/conventions and may not be combined with other promotional offers. Other restrictions and blackout dates may apply.